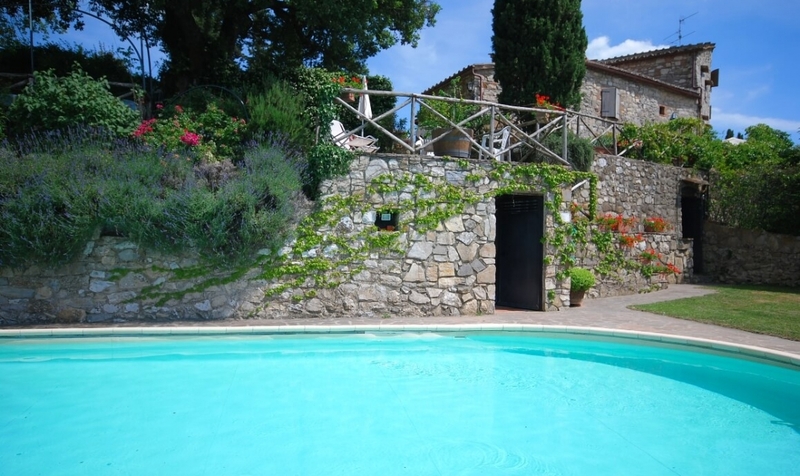 Comfortable holiday villa with private pool on the ground floor of a farmhouse carefully and tastefully restored. The property is completely fenced in and set on different levels and is part of a farm which produces Chianti Classico docg and olive oil. Wonderful view over the surrounding hills and over the village of Castellina in Chianti. The owners, very nice and helpful persons, live on the 1st floor of the farmhouse. Independent heating. Final cleaning included in the rental price. Distances: Castellina in Chianti with all kinds of shops, restaurants, post office, banks 6km, Radda in Chianti 7km, Vagliagli with ABV offices 16km, Gaiole in Chianti (L'Eroica) 17km, Poggibonsi 25km, Siena 29km, San Gimignano 38km, Florence 52km, Cecina with beaches 92km, Castiglione del Lago (Lago Trasimeno) 97km, Pisa 150km, Rome 305km. At guests' disposal: panoramic private swimming pool (6m x 15m, depth 1,50m, open 15/05 - 01/10), fenced garden, panoramic terrace with table and chairs, built-in barbecue, covered private parking. Baby cot and high chair available (free of charge). On request and to be paid on site: cooking classes and dinners (organized by the owners), trekking tours. Internet on request for free. Ground floor: living room with SAT-TV, kitchen (dishwasher, washing machine, fridge 140lt, microwave) with fireplace open onto the living room, one twin bedded room with access onto the outside, one double bedroom with access onto the outside, bathroom with shower. Private equipped outdoor space with a gazebo with table and chairs.